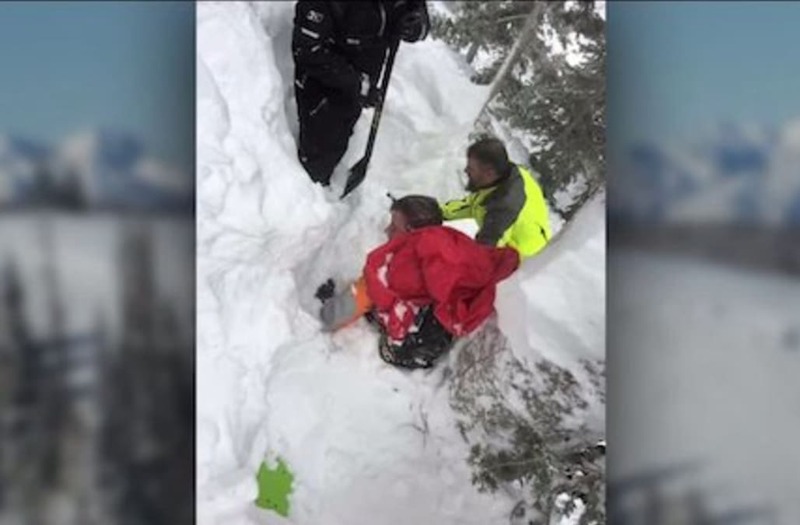 NORTHERN UTAH (KTSU) -- It was a close call when a Tremonton man got trapped in an avalanche this week while he and his family were snowmobiling near the Utah—Idaho border. Kaden Francis of Tremonton described the moment the avalanche began. “It sounded like thunder rolling through the trees," he said. "You could hear limbs breaking and trees snapping. It was scary." As the deafening sound echoed through the mountains, the football-field-sized avalanche tore through the hillside near the Franklin Basin of Logan Canyon. Francis quickly realized his 20-year-old brother was trapped in the slide. “I called over the radio and said, “Avalanche. Avalanche. Trace was buried,” Francis said. Not knowing where he was, Francis searched for his brother's avalanche airbag, praying he deployed it. “When I finally saw the airbag and it was against the tree, I just, I mean: Worst case scenario is what comes to mind,” he said. His brother was buried under the thick, heavy snow—his head barely above the surface. “I started running towards him, he's only 50 yards away from me up the hill, but with that deep of snow it felt like it took me an hour to get to him,” Francis said. Thankfully his brother was OK, but his foot was pinned between the snowmobile and the tree. “He kept saying, ‘hurry, hurry my leg,’ and we couldn't dig fast enough," he said. "Time stood still. Everything we did just seemed too slow." For 45 minutes, Trace's brother, father and uncle struggled to get him out. The snowmobile was crushed, and Trace walked away unharmed. But Francis says without the right gear, things could have ended tragically. “We would not have found him. He would have been completely buried. That [avalanche air bag] is what saved his life. He would have been completely under,” Francis said of what could have been. And as an experienced snowmobiler, he has a message for other outdoor enthusiasts. “We thought it’s never going to happen to us, never going to happen," he said. "It’s not a matter of if, it's when.". During the winter season, there are countless close calls like this, but some aren't so lucky. On average, four people die in avalanches every year in Northern Utah. The Utah Avalanche Center says this is a reminder to always check conditions before recreating in the mountains and to ensure you have the right gear. The Francis family expressed their gratitude for those at the Utah Avalanche Center and the work they do. Firefighters arrive near Hotel Rigopiano, hit by an avalanche, in Farindola, central Italy, in this January 19, 2017 handout picture provided by Italy's firefighters. Vigili del Fuoco/Handout via REUTERS ATTENTION EDITORS - THIS IMAGE WAS PROVIDED BY A THIRD PARTY. EDITORIAL USE ONLY. A photo taken from a video shows the snow inside the Hotel Rigopiano in Farindola, central Italy, hit by an avalanche, in this January 19, 2017 handout picture provided by Italy's Finance Police. An aerial photo shows the rescuers heading to Hotel Rigopiano in Farindola, central Italy, hit by an avalanche, in this January 19, 2017 handout picture provided by Italian Police. A photo taken from a video shows a survivor, helped by rescuers, coming out from Hotel Rigopiano in Farindola, central Italy, hit by an avalanche, in this January 19, 2017 handout picture provided by Italy's Finance Police. A photo taken from a video shows a rescuer entering the Hotel Rigopiano in Farindola, central Italy, hit by an avalanche, in this January 19, 2017 handout picture provided by Italy's Finance Police. A still image taken from a video shows firefighters working at Hotel Rigopiano in Farindola, central Italy, after it was hit by an avalanche, January 20, 2017 provided by Italy's Fire Fighters. Vigili del Fuoco/Handout via REUTERS ATTENTION EDITORS - THIS IMAGE WAS PROVIDED BY A THIRD PARTY. EDITORIAL USE ONLY. A still image taken from a video shows a firefighter working at Hotel Rigopiano in Farindola, central Italy, after it was hit by an avalanche, January 20, 2017 provided by Italy's Fire Fighters. Vigili del Fuoco/Handout via REUTERS ATTENTION EDITORS - THIS IMAGE WAS PROVIDED BY A THIRD PARTY. EDITORIAL USE ONLY. A still image taken from a video shows firefighters working at Hotel Rigopiano in Farindola, central Italy, after it was hit by an avalanche, January 20, 2017 provided by Italy's Fire Fighters.Vigili del Fuoco/Handout via REUTERS ATTENTION EDITORS - THIS IMAGE WAS PROVIDED BY A THIRD PARTY. EDITORIAL USE ONLY. A still image taken from a video shows the snow inside the Hotel Rigopiano, central Italy, after it was hit by an avalanche, January 20, 2017 provided by Italy's Fire Fighters. Vigili del Fuoco/Handout via REUTERS ATTENTION EDITORS - THIS IMAGE WAS PROVIDED BY A THIRD PARTY. EDITORIAL USE ONLY. Firefighters work at Hotel Rigopiano in Farindola, central Italy, after it was hit by an avalanche, in this handout picture released on January 20, 2017 provided by Italy's Fire Fighters. Vigili del Fuoco/Handout via REUTERS ATTENTION EDITORS - THIS IMAGE WAS PROVIDED BY A THIRD PARTY. EDITORIAL USE ONLY.